The small park in Connecticut keeps growing and growing! 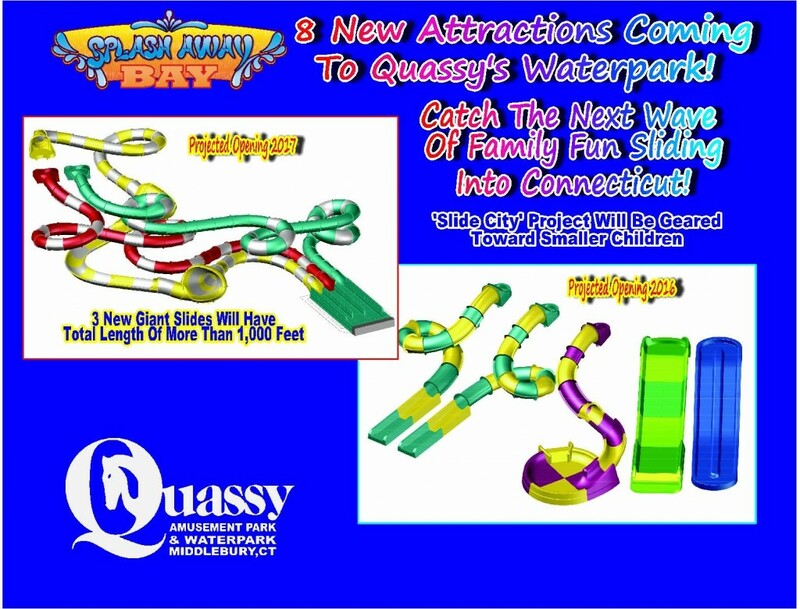 Today, Quassy announced plans to add two new slide structures to Splash Away Bay, which will double the amount of slides in the water park. 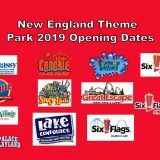 In addition to the new slides, the park will build a second maintenance building, a lakefront café for the water park, a new candy shop, and plans to replace some of the older rides with newer ones. The Slide City project will consist of five slides adjacent to the Saturation Station interactive modular water play structure. Two serpentine slides called KIDZ Twisters™, a two-person ProRacer ™, KIDZ Bowl 14 ™ and a KIDZ MiniRiver™ will make up the Slide City area. Four of the slides will end in shallow troughs while the bowl unit will gently send riders along the wall of a circular-shaped landing prior to exiting. 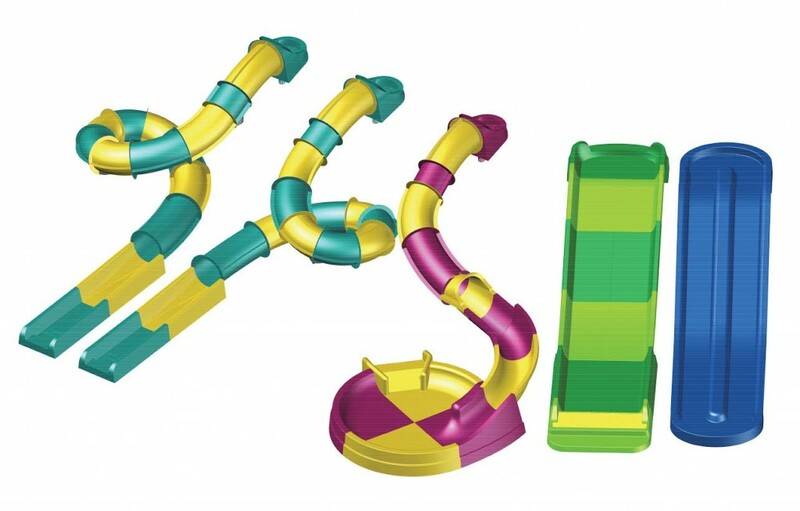 I have to say, the kiddie version of ProSlide’s traditional bowl slides looks very unique. Slide City is geared towards younger guests. It is expected to open in 2016. The larger slides, projected for opening in 2017, will be located in an area now occupied by picnic tables on the north side of the property. The largest of the three giant slides will be a TantrumTWIST™. The patented funnel shape flushes riders up the TANTRUM™ walls, oscillates each tube multiple times and generates the suspended-weightlessness sensation that is unique to ProSlide funnel rides. 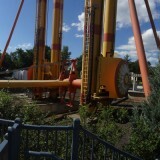 After dropping into the funnel, riders are swept up the wall to the equator line, which is actually perpendicular to the ground. 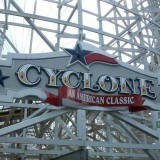 The ride creates the illusion of going over the edge keeps even the craziest thrill enthusiasts returning for more. This looks to be a totally new concept from ProSlide. The idea of having a slide with the illusion of riders flying off the edge sounds very intriguing. I don’t think any other water park in the world has installed one of these. 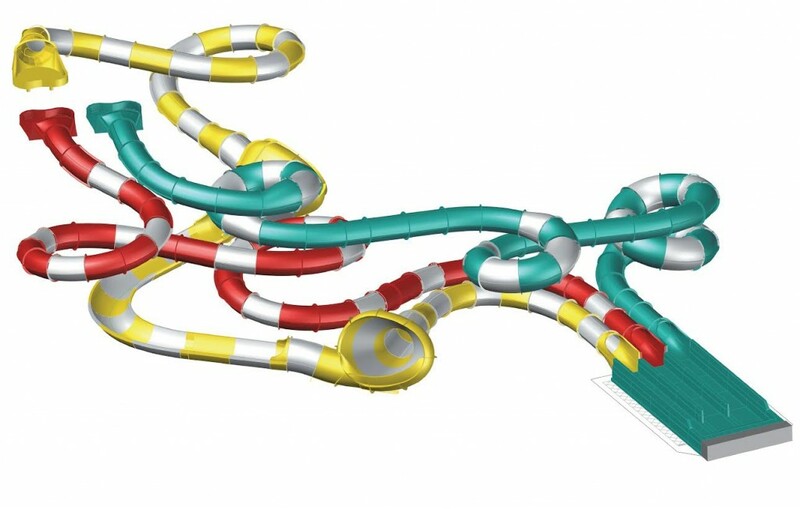 Two gigantic PIPEline™ serpentine slides will round out the three-ride attraction. The new slides will all depart from one platform and conclude in runoff troughs near Saturation Station. Picture from Quassy’s press conference today. Editors note: I moved the details about the new slides in the upper portion of this post. 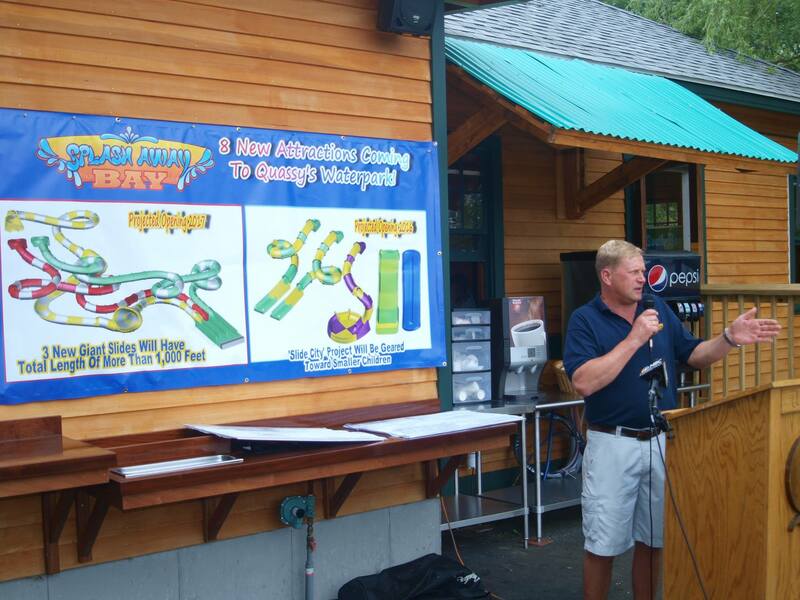 MIDDLEBURY, Conn. – Quassy Amusement & Waterpark here will more than double the number of waterslides at Splash Away Bay over the next several seasons, park officials announced today. 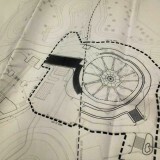 In addition, the park revealed other improvements to take place in the coming years. The lakeside waterpark adjacent to Quassy Beach will introduce eight new slides, including what will be titled Slide City for younger children, as well as three giant slides with a combined length of more than 1,000 feet. “We’re excited about further expanding the waterpark as it has become a venerable part of the guest experience here at Quassy,” Park President Eric Anderson said of the project. Also, Quassy will be building a new candy shop, beach snack building and replacing some rides within the amusement area of the facility. An estimated $6 million will be reinvested into the historic lakeside park over the next five years. The new slides will be provided by ProSlide Technology, Inc., of Ottawa, Ontario, Canada. ProSlide was the vendor for the existing seven slides at the attraction, which was first introduced in 2003 as Saturation Station. “ProSlide is extremely proud to be the trusted partner to Quassy Amusement Park for every one of the waterslides at Splash Away Bay. 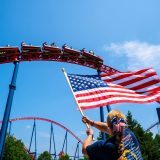 We are thrilled to be working again with the Quassy team to add brand new guest experiences to Splash Away Bay and more than double the number of rides over the next few years,” said Phil Hayles, vice president business development, ProSlide Technology. The existing popcorn concession near the Grand Carousel will be razed to make way for a new candy shop featuring a taffy manufacturing operation from yesteryear. A variety of taffy flavors will be served up in the shop along with a full line of assorted confectionary goodies, popcorn, and other novelty items. The taffy set-up will likely be operational in the existing popcorn stand before the new building goes up within the next few years. The planned two-story structure will house a human resources office and training room on the second floor. Guests at Quassy Beach and the waterpark will be able to purchase food and beverages at Splash Away Bay Café, a new lakefront structure slated to be built within the next year or two. In addition to providing food service within the waterpark area, the café’ will feature rooftop seating on a deck overlooking Lake Quassapaug. “We added cabana and beach lounger rentals this year, so it has become necessary for us to provide food and beverage service there for our guests,” Anderson said of the new restaurant. Both the candy shop and lakefront café’ were designed by Andrew Peklo III of Woodbury, Conn. The local architect also created the new ticket booth and group sales/season pass buildings at the park, which are reminiscent of Quassy’s “trolley park” heritage. The ticket booth opened in 2009 while the group sales building opened in 2014. Quassy’s Safety Department will also have a second maintenance building as part of the park’s upgrades. 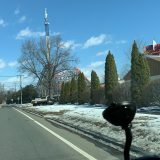 “With the addition of numerous new rides and attractions over the past several years it became apparent that our maintenance staff needed more room to accomplish its work, especially in the off-season when much of the equipment is indoors,” Anderson said of the planned structure. All of these new developments show that Quassy is continuously trying to improve. 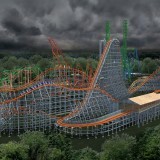 We couldn’t be more thrilled that the park is adding something new and exciting every single season. 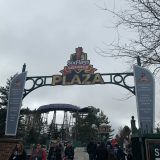 I say this every time I write about Quassy, but if you’ve never visited the park, make sure you do so soon! It’s New England’s little gem of an amusement park. Next story What’s going on around the Alpine Bobsled at the Great Escape?